Document Chest 3 drawer. 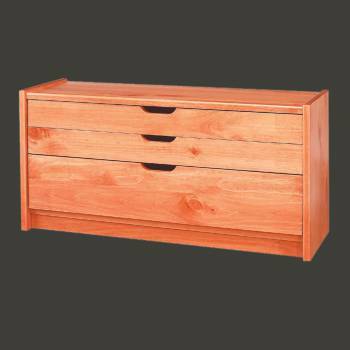 This solid pine document chest unit has 3 drawers. Customize flat storage to accomodate oversized papers, prints, etc. The chests may be stacked together, each sold individually. Crafted of solid pine the document chest comes in an Heirloom Pine Finish. 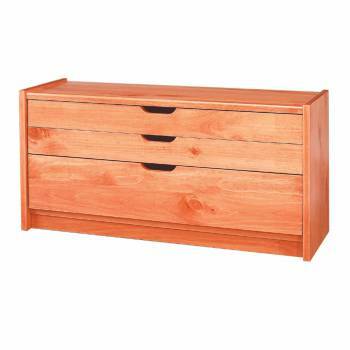 Top 2 drawers are 2 1/2 in. deep and the bottom drawer is 5 3/4 in. deep. Measures 16 1/2 in. H x 33 1/2 in. W x 12 1/2 in. proj.